The B-50's development was approved in 1944, when the aircraft was known as the B-29D. 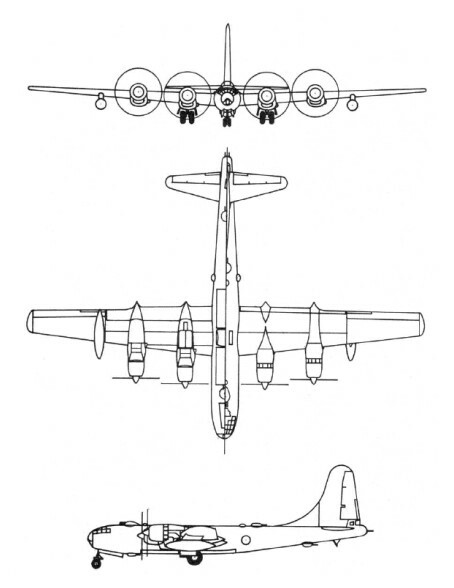 The Army Air Forces (AAF) wanted a significantly improved B-29 that could carry heavy loads of conventional weapons faster and farther. As World War II ended, the production of thousands of B-29s was cancelled. The B-29D survived, redesignated B-50 in December 1945, the improved bomber was now for the atomic role. The decision was pending availability of the intercontinental B-36 or of another bomber suitable for the delivery of atomic weaponry. Appeared in 1948 and looking identical to the B-29 Superfortress, the B-50 retained just 25 percent of the B-29's original components. Changes distinguishing the B-50 from its predecessor included an all new aluminum wing design that made the aircraft more resilient and efficient. Vertical tail surfaces were now designed to fold down, allowing the massive bomber the capability to be housed in air force hangars. A four engine heavy bomber powered by the Pratt & Whitney 3,500 horsepower R-4360-35 Wasp Major radial engine produced in about 370 examples up until 1953. Accommodations for crewmen included a total of ten personnel with access to 12 x .50 caliber machine guns in remotely-controlled barbettes and a 20mm cannon. Up to 20,000lbs of internal ordnance could be carried. While the short-range B-50 was immediately recognized as a stopgap measure, the magnitude of the aircraft's development problems proved unexpected. 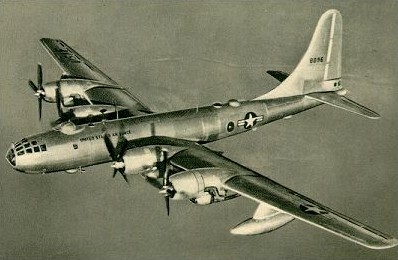 The B-50's first difficulties stemmed from its bomb bay which, like that of the B-29, was too small to house the new bomb and its required components. The fast development of special weapons created more complications, since the individual components of every single type of bomb had to be relocated within the bomb bay's narrow confines. The B-50 soon exhibited engine malfunctions. Then, cracking of the metal skin on the trailing edge of the wings and flaps dictated extensive modifications. While these problems were being resolved, new requirements were levied on the aircraft. In 1949, as the proposed RB-36 remained a long way off, and because of the older RB-29's deficiencies in speed, range, and altitude, some B-50s had to be fitted for the reconnaissance role. Fuel tank overflows, leaking fuel check valves, failures of the engine turbo-chargers, generator defects, and the like continued to plague every B-50 version. Contrary to plans, most B-50s came off the production lines without the receiver end of the new air-to-air refueling system being developed by Boeing. Additional, and successful, modifications ensued. Nevertheless, the Strategic Air Command (SAC) had no illusions. The B-50, along with the B-36 (first delivered in June 1948), would be obsolete in 1951. That the B-50 did not start leaving the SAC inventory before 1953 was due to the production problems and many modifications of its replacement: the subsonic B-47. B-50's would eventually be replaced by the jet-powered B-47 Stratojet by 1954, though many would go on to be modified as TB-50H crew and pilot trainers, the KB-50 aerial refueling aircraft and the RB-50 photographic reconnaissance platform. The KB-50 refuelling tankers had two J47 turbojets added in underwing pods, and were redesignated KB-50K. Still operational in 1955, the B-50D usually carries two 700-gal. fuel tanks or 4,000 lb. bombs under outer wings. All B-50's would be retired from service by 1965.